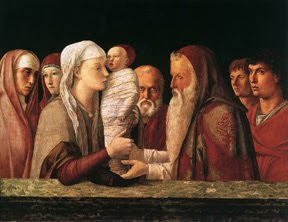 The Feast of the Presentation, often called Candlemas, commemorates the purification Mary and the presentation of Christ in the temple, which took place 40 days after his birth as Jewish law required. According to Mosaic law, a mother who had given birth to a boy was considered unclean for seven days. Also, she was to remain 33 days "in the blood of her purification." Luke tells us, quoting Exodus 13:2,12, that Mary and Joseph took Jesus to Jerusalem because every firstborn child was to be dedicated to the Lord. They also went to sacrifice a pair of doves or two young pigeons, showing that Mary and Joseph were poor. Once in the temple, Jesus was purified by the prayer of Simeon, in the presence of Anna the prophetess. 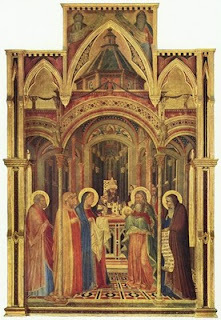 ("a light to the revelation of the Gentiles"), By the 11th century, the custom had developed in the West of blessing candles on the Feast of the Presentation. The candles were then lit, and a procession took place through the darkened church while the Canticle of Simeon was sung. Because of this, the feast also became known as Candlemas. Candlemas is still an important feast in many European countries. Today, the feast is still celebrated on February 14th in some Eastern Churches, including the Armenian Church, where the feast is called, "The Coming of the Son of God into the Temple." Most churches in the West celebrate it on February 2nd.